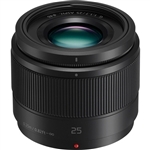 A fast, normal prime designed for Micro Four Thirds mirrorless cameras, the Lumix G 25mm f/1.7 ASPH. 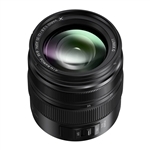 Lens from Panasonic is a 50mm equivalent lens featuring a bright f/1.7 maximum aperture for enhanced low-light shooting and depth of field control. One UHR (Ultra-High Refractive Index) element pairs with two aspherical elements to reduce chromatic aberrations and distortions for consistent edge-to-edge sharpness and illumination. The optical construction also helps to realize a compact overall form factor, measuring just 2"-long and weighing 4.4 oz. Benefitting both stills and video capture, this lens also incorporates a stepping motor for smooth, quiet autofocus performance that is compatible with Lumix cameras' high-speed contrast-detection focusing systems. The 7.5mm f/3.5 Ultra Wide-Angle Fisheye Lens for Micro 4/3 (Black) from Rokinon gives you a 180° view with dramatic, exaggerated perspective when used with a Micro 4/3 camera. With hybrid aspherical lenses and a multi-layer coating, you'll be able to produce sharply defined images with a minimum of flare and ghosting. This compact and lightweight manual focus 7.5mm lens focuses as close as 4" (10.16 cm) from the lens for even more dramatic effects. This lens has a built-in petal lens hood. The Lumix G Vario 12-32mm f/3.5-5.6 ASPH. 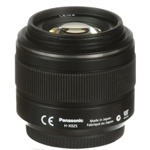 Lens from Panasonic is a wide-angle to short telephoto focal length zoom lens for Micro Four Thirds format cameras. Its 35mm focal length equivalence is 24-64mm. With a retractable design, the lens is quite compact, especially when the camera is powered down. A simple turn of the zoom ring extends the lens when ready to shoot and retracts it when not shooting. Panasonic's MEGA Optical Image Stabilization provides compensation against camera shake in order to create images with less blur when shooting in low light or anytime the shutter speed is slowed. The lens can focus as close as 7.9" at the wide-angle end and as close as 12" at standard and telephoto lengths. The 60mm f/2.8 DN Lens for Micro Four Thirds Mount Cameras from Sigma is a prime lens compatible with Olympus and Panasonic Micro Four Thirds mount cameras. With a 120mm focal length equivalent in the 35mm format, this is a mid-range telephoto length lens with numerous applications including portraiture. A maximum aperture of f/2.8 provides shallow depth of field and makes this lens effective in low light. The minimum focus distance on this lens is 19.7" (50 cm) and its maximum magnification ratio is 1:7.2. The Lumix G Vario 12-60mm f/3.5-5.6 ASPH. POWER O.I.S. from Panasonic is a Micro Four Thirds system lens that spans a versatile 24-120mm equivalent focal length range. Covering wide-angle to telephoto perspectives, the lens' design incorporates three aspherical elements and one extra-low dispersion element to reduce spherical and chromatic aberrations throughout the zoom range for increased clarity and image sharpness. Additionally, POWER Optical Image Stabilization system helps to compensate for the effects of camera shake and is also compatible with cameras featuring Dual I.S. for robust stability to benefit handheld shooting in difficult lighting conditions. The T Speed Booster Ultra 0.71x Adapter for Canon Full-Frame EF-Mount Lens to Micro Four Thirds-Mount Camera from Metabones allows a full-frame Canon EF-mount lens to be mounted onto a Micro Four Thirds-mount camera. While doing so, the adapter's optics help to maximize the connected lens's apparent angle of view while providing a 1-stop increase for the camera over the lens's aperture range. A versatile zoom covering wide-angle to portrait-length perspectives, the Lumix G X Vario 12-35mm f/2.8 II ASPH. POWER O.I.S. lens is designed for Micro Four Thirds cameras, where it provides 24-70mm equivalent focal length range. A constant f/2.8 maximum aperture affords consistent performance throughout the zoom range, and benefits working in difficult lighting conditions as well as enables greater control over depth of field. A POWER Optical Image Stabilizer minimizes the appearance of camera shake to suit handheld shooting, and this O.I.S. system is also compatible with Dual I.S. for enhanced stabilization performance.